A Big Step Towards Our Decentralized Future: I've Joined the eosDAC Launch Team! Back in 2013 when I started my bitcoin journey, I learned about the terms "DAC" and "DAO." My mind was totally blown. A decentralized autonomous organization (DAO), sometimes labeled a decentralized autonomous corporation (DAC), is an organization that is run through rules encoded as computer programs called smart contracts. A DAO's financial transaction record and program rules are maintained on a blockchain. The precise legal status of this type of business organization is unclear. Did you notice that last part? That's what gets someone like me so excited. If you'd like to watch me talking through this post instead of reading it, please scroll to the bottom to view it as a video. This is an Opportunity to Change the World. We're all aware of the corruption we see in nation-state governments around the world and the crony, revolving-door, regulatory captured corporations who maximize profits for board members at the expense of customers (and the planet). One of the promises of decentralization and blockchain technology is to not only expose this corruption via the transparency of a global ledger, but to also give individual stake-holders actual power in the decision-making process of larger entities via smart contracts and stake-holder weight. I've been excited about DAC/DAO's since day one. To me, they represent the obvious future where technology allows, for the first time, networks to be more efficient than hierarchies. I think much of our primitive tribalism causes us to gravitate towards hierarchy even in situations where we rationally prefer flat networks. For us to succeed, we need structure and tools to make progress towards our goals. That's where eosDAC comes in. A Decentralized Autonomous Community (DAC) is governed by its constitution, which is encoded in smart contracts on the blockchain. This revolutionary way of bringing a community together as a cooperative is made possible by the EOS software. The DAC is controlled by its token holders and the board members they vote to run its operations. 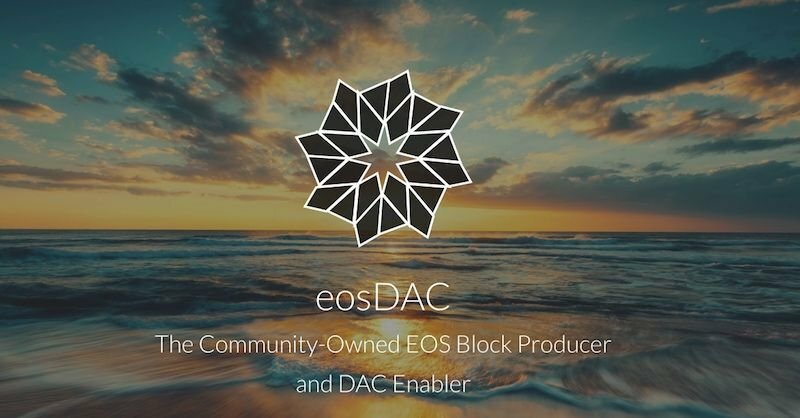 eosDAC will be built on top of EOS and itself is a candidate for becoming an EOS block producer. That's similar to a STEEM Witness (which you can learn more about here). I love how we'll be building tools that we use ourselves as a DAC. So many people in the blockchain space understand the concept of a DAC and the value they can bring to humanity, they are just waiting for more proven examples of how they work. This means eosDAC has the opportunity (and responsibility) to not only set an example for what's possible, but also become a positive force in the world others will use to decentralize existing systems. We can be the example of the change we want to see in the world. Not only that, as we try, struggle, fail, succeed, and grow, the tools we create will be open-source and available to others for managing their own decentralized, autonomous communities. I'm a huge fan of Dan Larimer based on his explorations of free market solutions to secure life, liberty, and property for all. 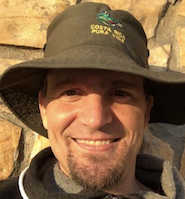 I consider him one of the most prolific blockchain developers in existence as the creator of ProtoShares, BitShares 1.0, BitShares 2.0, STEEM, and now EOS. He has genius-level abilities and even those who don't like something about him personally admit his technical blockchain skills are incredible. I want to be involved in helping EOS because I've already greatly benefitted from @dan's creations in BitShares and STEEM, and I see how those creations can improve well-being in the world. 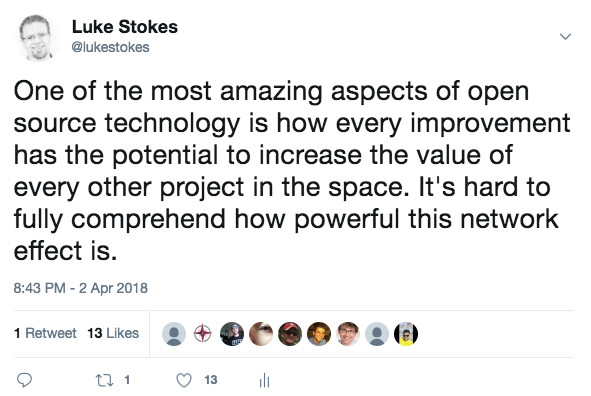 I see EOS as an enterprise-grade platform for building many more decentralized systems we can all benefit from. I started blogging about EOS and their ICO over ten months ago (here, here, here, and here). I even spent a day learning Wren back when it was thought that would be the language of EOS smart contracts. I'm passionate about EOS, but I couldn't decide if I was going to put myself out there as a solo block producer candidate or if I was going to team up with an existing team. I also figured my existing company might take up too much of my time which is why I sold it. For weeks and months I've been talking with @eosnewyork and @eosdac as they both approached me and asked me to join them. It was a tough decision, but this Monday I put together all my thoughts in a pros/cons list for my three options (solo, NY, or DAC) and met again with each group to make my decision. As much as I love and respect the @eosnewyork team and think they will be a hugely valuable block producer to the EOS system, my desire to see decentralization improve the world convinced me to take a risk and join @eosdac. There are no proven models to follow here. It's uncharted territory. 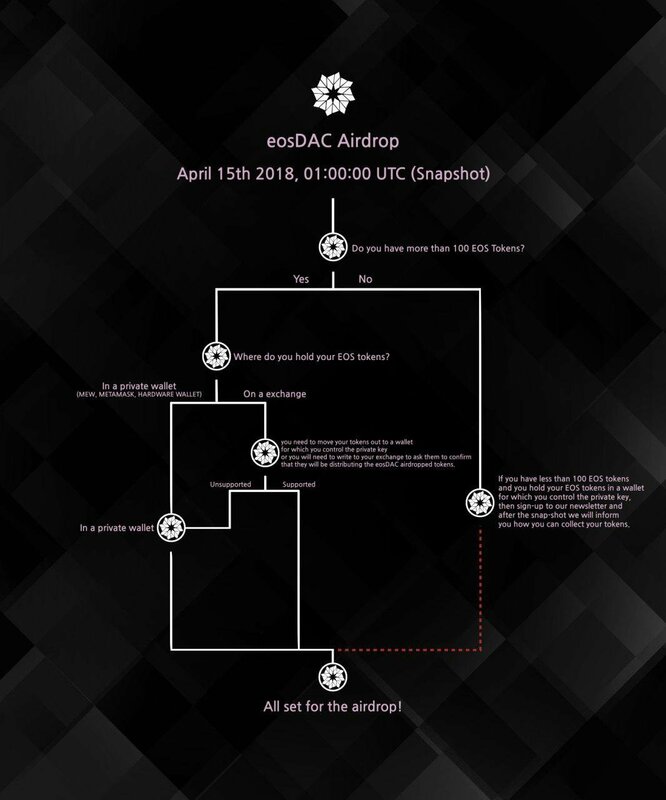 Holding the eosDAC token will allow members who join eosDAC to participate in the governance of the DAC. The best way to think of them are as free invitations to join a club. Keep in mind the "legal status of this type of business organization is unclear" so we're purposefully making no promises here as to what token holders should expect. For more information, please see eosdac.io and the eosDAC FAQ. Many who have been following the drama between Ned (CEO of Steemit) and Dan (co-founder of Steemit, now building EOS) are probably asking, "But what about STEEM!?!" In my opinion, competing currencies and competing blockchains in an open-source framework is a wonderful, beautiful thing. Yes, EOS may some day have a competitor (or multiple competitors) to Steemit running on that blockchain. At this time, I do not view that as a direct threat to STEEM or Steemit. Just as I still use Facebook, Twitter, Medium and the like, I will still use Steemit in the future unless I have a reason not to anymore (sorry MySpace, I don't even know my old login). By working with eosDAC and EOS, I think I'll only further increase my value to the STEEM blockchain as a witness. Thankfully, that's not up to me to decide and will ultimately be judged by the STEEM stake holders and their vote. My hope is, the DAC tools we build for eosDAC will help DACs on many blockchains including STEEM to better organize their communities for effective action. I have zero intention of decreasing my focus on STEEM, even as I continue serving the larger blockchain community with education, experience, and development. Joining a team is a big deal for me because it involves putting my trust in others and a brand in ways I can't control. From what I've seen of the eosDAC team so far, I'm feeling really good about this decision. I really believe those involved want to improve the world, and I like the DAC structure as a fantastic way to do it. If you want to get involved and contribute, please join the eosDAC Telegram channel. There are opportunities to contribute which may involve eosDAC tokens as well, so join up and check it out. 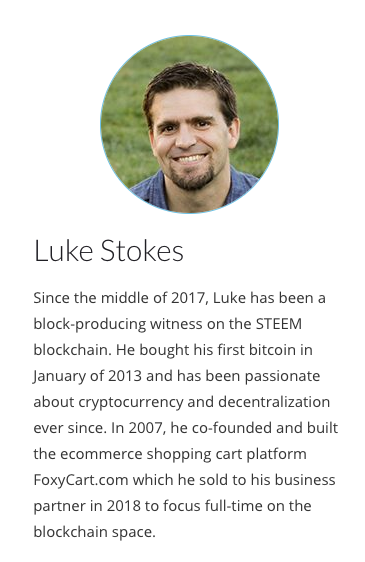 Thank you all for your continued support of my witness @lukestokes.mhth as I work to help educate the community about cryptocurrencies, DPOS, and STEEM. I care very deeply about social engagement (I'm up over 11.6k posts and comments now!) because this is a social blockchain powering social applications. In my opinion, just as it's important for witnesses to have technical skills, they should also have social skills to properly support and appreciate the applications they enable. I also wanted to mention, in case someone notices and draws the wrong conclusion, I'm powering down for the first time since I joined Steemit. The sole reason for this is because our tax bill this year was nasty due to cryptocurrency trading in 2017. I want to keep some STEEM liquid in case we need to access it as a family for other expenses. I know many voluntaryists and anarchists passionately advocate not paying taxes (and I agree with them!) and yet I've seen very few who are publicly exposing themselves and their families to the dangers of either not filing or filing fraudulently. I won't get into my reasonings for why I think taxation is a form of extortion, but I did want to bring up my reasons for powering down in case someone was confused. I'm as committed to STEEM and excited about its future as I ever have been. I think this blockchain will radically improve the lives of many millions of people, and that's why I'm so very honored to be here. I've also put my money behind what I believe in. Back in July of 2016, I invested 9.5 BTC into STEEM and that investment is down almost -7.75 BTC (lesson learned: don't FOMO buy at the top of the market). I'm not concerned because I've not only received great value from that investment through blogging, relationships, and experiences thanks to STEEM, but because I believe in the future value of this "blockchain of opportunity" as @andrarchy described it last weekend. If you're here reading this, you're part of the decentralized revolution. The financial war we're in requires tools to win, and I believe STEEM, EOS, and eosDAC will help power those tools. As always, if you have any questions, please fire away, and I'll do my best to answer them. This post represents my personal views as they are at the time of this post and not any official views of eosDAC.